Helen Piercy is an English filmmaker who studied graphic design and animation. She teaches animation workshops for young people, and that’s where this small, but detailed and engaging publication comes from. First of all there’s the animation handbook which explains a bit about the history of filmmaking and goes into different kinds of animation. There are diagrams and how-to instructions for things like simple flip books and a cardboard zoetrope, as well as morphing characters and pixilation. Tips on creating characters and storytelling are valuable and equally applicable to writing of all sorts, and you’ll learn about storyboarding, timing, staging, special effects, filming … the list goes on. Then there’s the “box”, a fold out set with a window and door to use in creating your own stop motion movie. 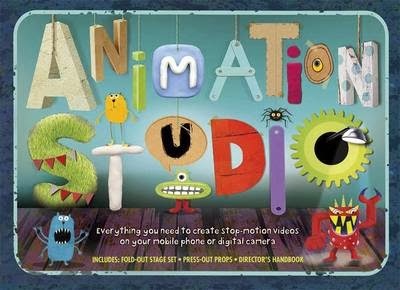 It comes with press-out shapes to use as props for characters and scenery, and all of this combines to become your very own stop motion studio. Animation Studio is a surprise packet which would be a fantastic holiday project for children, particularly if they’re interested in storytelling or making movies. I’m even inclined to have a try at making something myself, but can’t decide where to start: cut-out, board or clay animation? You can watch a book trailer by the author here.